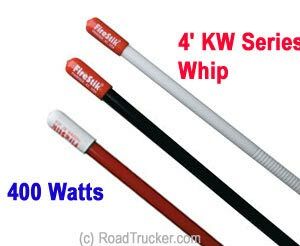 The FireStik KW Series 400 Watt Whip Antenna features hi-performance loading coil that maximizes the transmit/receive functions of your CB. This top-loaded antenna will also receive the NOAA emergency weather alert and national weather broadcasts for radios with those features. Available in 3 Colors - Black (KW-4BK), White (KW-4WH), and Red (KW-4RD). Pioneer "Cut-to-Tune" FireStik "KW" Series 40 Channel Plus CB Antenna is the most well-known wire-wound CB antenna in the world - proven performer since 1975. Suitable for trucks, vans, autos, motorcycles and ATVs in a single antenna or in dual/co-phased configuration on any vehicle made from any type of material. The "KW" antennas MUST be tuned (SWR) after installation on the vehicle. The loading coil on all "KW" antennas is easily accessible for precise SWR adjustments. All "KW" series antennas are factory bench tested for resonant frequency and overall quality.